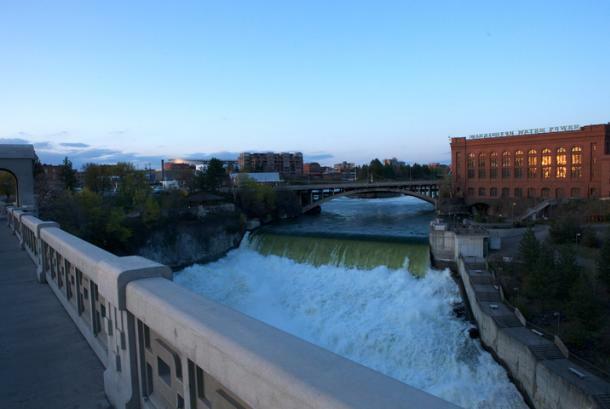 Spokane boasts the second largest urban waterfall in the country. It’s actually a series of cascading waterfalls that flow through Riverfront Park and drop below the Monroe Street bridge. The series of bridges and viewing points around the falls allow visitors to tour around the upper and lower falls with 360 degrees of visibility. History The falls derive their name from the Spokane Tribe of Indians that first inhabited the area. They named it “Stluputqu” meaning “swift water”. It was a very important place for the natives where the salmon were plentiful. In 1890, the Washington Power Company, now Avista Utilities, completed the Monroe Street Dam. It’s not the longest running hydroelectric facility in Washington State. The turbine has a generating capacity of 14.82 MW. The Upper Falls Power Plant was constructed in 1920 as a diversion for the water to be passed through the lower falls turbine. It has a generating capacity of 10 MW. In 1974, Spokane hosted the first environmentally themed World’s Fair. Much of Riverfront Park was developed to accommodate the fair. Today, we have a wonderful system of walking bridges that connect both sides of the river and the park to downtown Spokane. In 2013, a new section of the Centennial Trail was completed, connecting the Kendall Yards shopping and dining district with the paved path running under the Monroe Street Bridge and providing spectacular views of the lower falls. In 2014, Avista and the City of Spokane partnered to open the beautiful Huntington Park. The park drops down between City Hall and the Washington Water Power building offering many different levels to view the falls. Down the stairs, you can enjoy the “soak zone” as you walk right up to the falls and experience the power of the water. The park has a significant amount of grass and art installations honoring the falls Native American history. The most striking piece is the “Salmon Chief” sculpture, a larger than life metal sculpture by famous Spokane artist “Smoker” Marchand. Vantage Points There are dozens of fantastic viewpoints of the Spokane Falls. Most visitors catch their first glimpse of the falls from the east side of the Monroe Street Bridge. Then on the north end of the bridge, a sharp right turn into a grassy extension of Riverfront Park will bring you to multiple viewpoints of the falls with downtown as its back drop. Take a stroll west on the Centennial Trail for a head on view of the lower falls. Then walk across the Post Street bridge and drop down into Huntington Park on either side of the Washington Water Power building for some up close and unforgettable photos. Don’t forget about the upper falls. Catch your first glimpse to the east from the Post Street bridge. To access the suspension walking bridge, take a left from the south end of the bridge and head into the park. If you stay left, you will see the bridge entrance about 150 feet up, just past the smaller station building. Walk across the first suspension bridge and continue around the island to find the second one. You can’t beat the views! If you really enjoyed the walking bridges, consider taking the walking bridge tour offered by Spokane County Parks and Recreation. The tour takes you across all 17 bridges that span the river between Monroe Street and the Don Kardon footbridge by Gonzaga University. Tickets range between $12 - $19 dollars. Children four and under are always free. Spokane Falls SkyRide The Spokane Falls SkyRide is one of the most memorable and iconic experiences in the northwest. This 15 minute ride was named by Conde Nast as "One of the Top 12 Scenic Cable Rides in the World" in 2013. It starts in Riverfront Park and cascades down 200 feet over Huntington Park Natural Area, the Spokane River and beneath the Monroe Street Bridge. 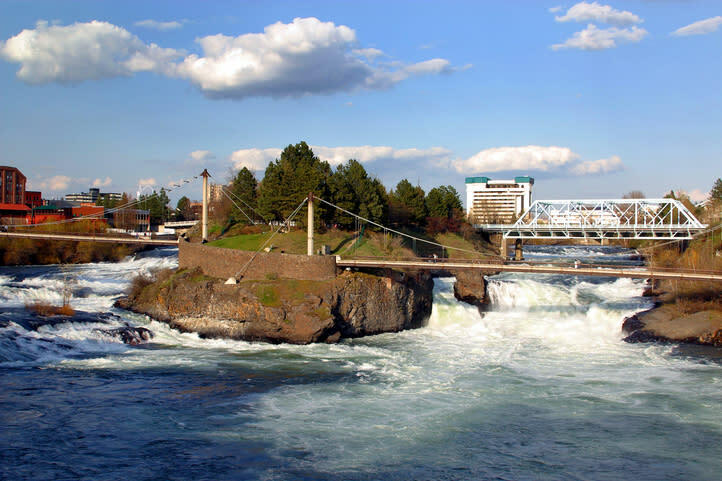 Along the ride, you can take in one of the best views of Spokane River Falls.